Adjusting the flashing border size. 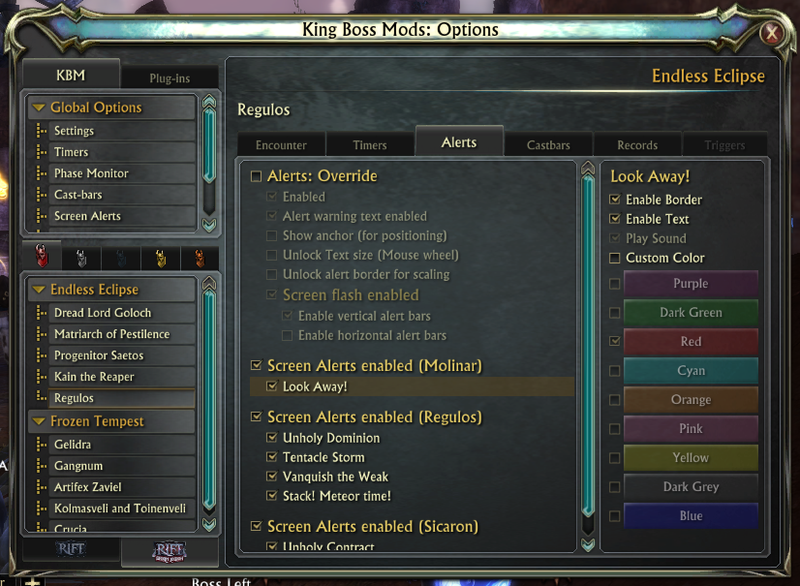 Open the options page for KBM in game by either left clicking the crown icon or typing /kbmoptions in the chat window. Select Screen Alerts from the left hand menu panel. Ensure there is a tick in the box next to "Show anchor (for positioning)." Ensure there is a tick in the box next to "Unlock alert border." Move your cursor over either border at the sides of your screen and move your mouse wheel to adjust the size. First off, locate your RIFT game folder and delete or back-up log.txt. You'll be using this as your new translation base each time. Ensure you are running your desired translation language in the Rift Client options. Make a macro which will enable the non-combat log, end the command line and then disable the non-combat log. Run the macro once, and ensure that a new Log.txt file has been created in the RIFT game folder. Once renamed, open up the above file in a text editor of your choosing, ensuring the type is converted to UTF8. The detailed report list will contain all the information you and I need to apply translations. You can remove this yourself using a Find-Replace regular expression (see above) match to "". Or, leave it as is and I can remove it myself. The output is grouped by Directory, then File, then Sub-Types (i.e Ability, Unit... etc), and finally a list of missing translations with correct syntax. Taking the above example, you would replace the quoted phrase with your languages' correct translation. Note that in this example, the Sub Type is Unit so this would require an exact translation. Sub Types such as Verbose can be loose translations which best represent the original English phrase in your own language. Finally, if the translation from English to your language is the same, please append "-- Same" to the end of the dictionary entry. This will enable me to set the translation flag to true and stop that translation from being listed in the report. In order to test in your own version of the Addon. Simply copy the dictionary definition to the appropriate place in the listed file. For the sake of the Vladmal prime example, that would be located in "/Hammerknell/Prime.lua" as listed in the output. If during the process of translation anything is missing a dictionary reference. Please let me know and I'll ensure a new dictionary reference is created for the next alpha cycle.